Click Start, Control Panel to open it. Look for the element that you want to add to the jumplist permanently. 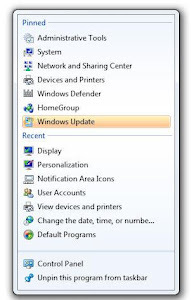 Click it and pull it onto the Control Panel icon in the taskbar, until the text “Pin to Control Panel” appears—then release your mouse button. If you now right-click the Control Panel icon in the taskbar, the element will show up permanently in the Pinned section. To remove the added entry, open the jumplist and click the pin on the right side of the element.